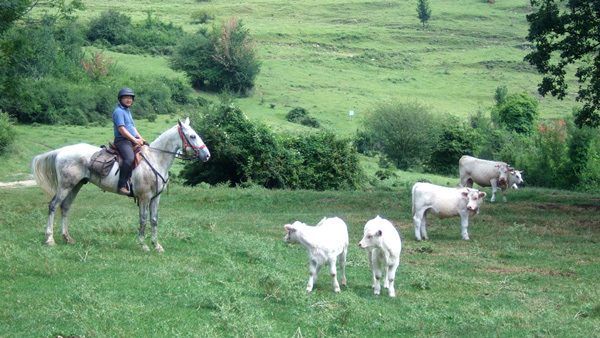 This trek is not without the difficulties that one might encounter on any cow-herding journey. Therefore, everyone must be prepared to collaborate and to work as a team. This is not just a simple tourist trek through the mountains. We have a goal: to get the herd to their destination totally intact that will require problem-solving and everybody’s best effort. 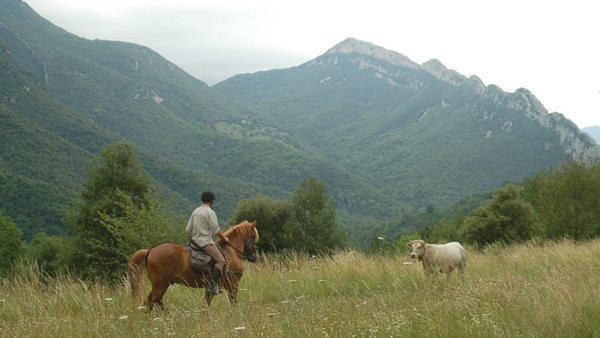 The farm house serves as a gateway to the delightful region of l'Empordà and will welcome us to the start of our unique cattle herding experienceBefore dinner you will be told about the special characteristics of our Arabian crossed and Paint trail horses. You will be given an introduction to the week’s program with an opportunity for a one-to-one conversation designed to find every rider their perfect horse. Then you can enjoy a fantastic dinner! After breakfast and tacking up, we leave the farm house following a ridge with spectacular views of forest, rosemary and thyme. 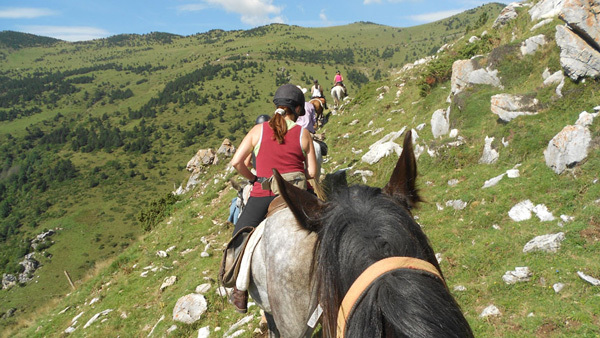 Up to the Fluviá, out of the rolling hills onto the plains, we canter and gallop through olive groves and fields of wheat, past country farmhouses and churches and into the foothills of the Empordà. Today we’ll not ride with the cattle but prepare our team strategy to work tomorrow in perfect coordination. 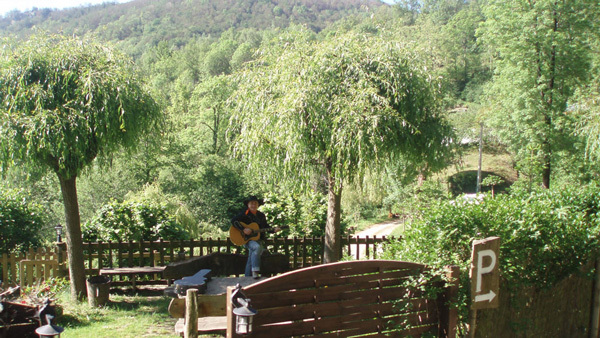 Our destination is to a charming Hotel where you will enjoy a dinner with our music who will accompanies us throughout the week with his guitar and his lovely songs. 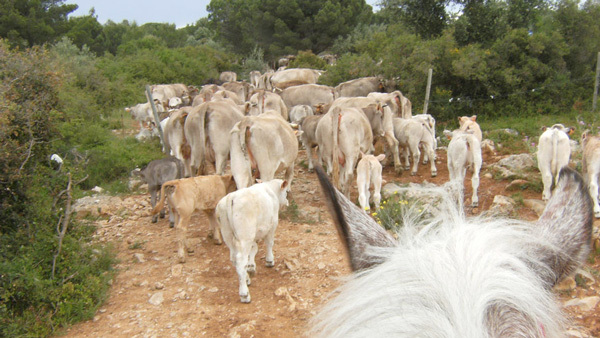 The route we will take to reach our first stop in Sant Llorenç de la Muga, where we will rejoin the cattle and the herder, we ride through typical Mediterranean brush wood forest, thick with bushes and calcareous soil. This is a rocky area with old buildings of traditional rural architecture like shelters for herders and small stone walls. When we reach the St. Quirze d’Olmells shrine, the vegetation will change completely, and become a Mediterranean forest which will continue until we reach the plains of Palau Surroca and the castle of La Roca. From here on to Terrades we will take a short rest beside the Sant Sebastià shrine. We will climb the Serallonga mountain chain. From this altitude we will be able to see the Boadella marshland and follow it down until it becomes the Muga River, which will then take us to St. Llorens de la Muga for lunch. 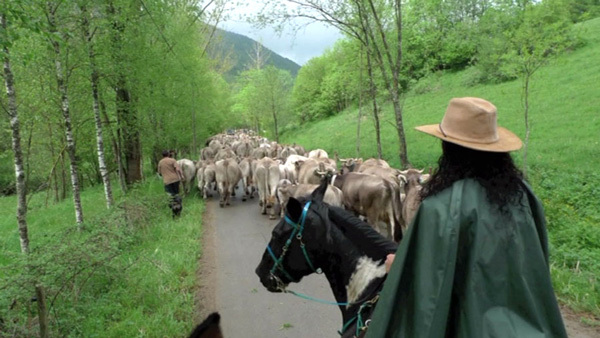 After a two-hour break, we will resume our journey with the cattle, which will take us down to Albanyà. Once we arrive we will go to the Bassegoda Camp Site, where we will have dinner and spend the night, leaving our horses with the cattle in a nearby field. We will spend the night in small and comfortable wooden bungalows. This is an ideal place for wildlife lovers in the middle of nature. It is a door to the wild, for during the following 48 hours the only traces of civilization we will find are some chapels from the eleventh and twelfth centuries and a few houses in ruins. There is no phone signal during this time. 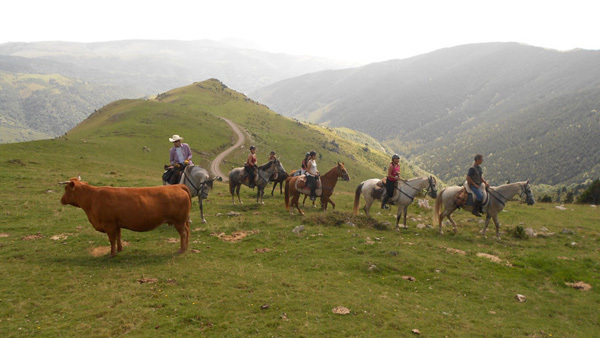 After breakfast we will go to the field where our horses are, and prepare everything for the two next days which will include breathtaking views and fresh air. At lunch time, we will join the cattle that have started off earlier in the morning. From now on we will stop seeing roads and cars and we will enter the Massif of Bassegoda (895m/2936.351ft) that dominates the entire valley. We will follow the paths parallel to the "torrent of Píncaro", a tributary of the Muga River. This will take us towards the Coll de Bassegoda and the Coll del Principi (1172m/3845.114ft ) Here, on this vast open plain of red pine woodlands, we will once again join the cattle. 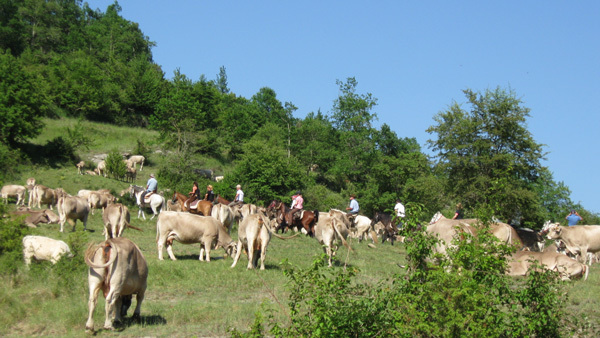 We ride together to the “¨Comella” house for our picnic and leaving here the cattle. 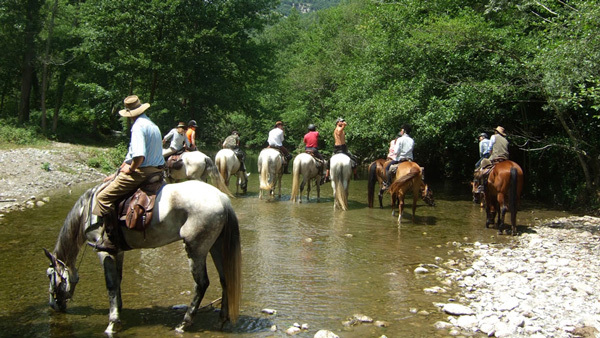 We will then ride to the “Morato” where we will set up camp with tents, campfires and spend a lovely evening, leaving the horses to graze freely around us. The cultural value of this valley is of great importance. There are about 15 sanctuaries, shrines and monasteries, all dating between the years 980ad and 1200ad. The most important are Sant Pere de Albanyà, Sant Bartomeu del Pincaró, Sant Miquel de Bassegoda and Sant Julià de Ribelles. 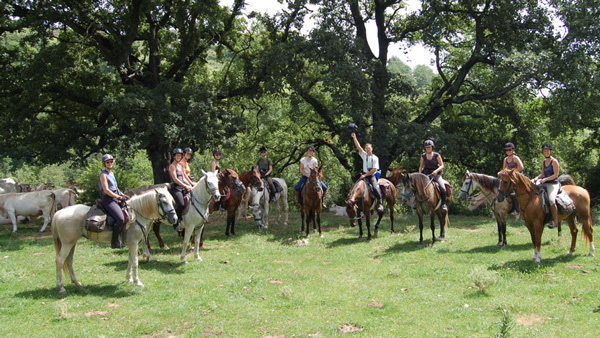 After breakfast we will round up our horses and get everything ready to start the day’s route. 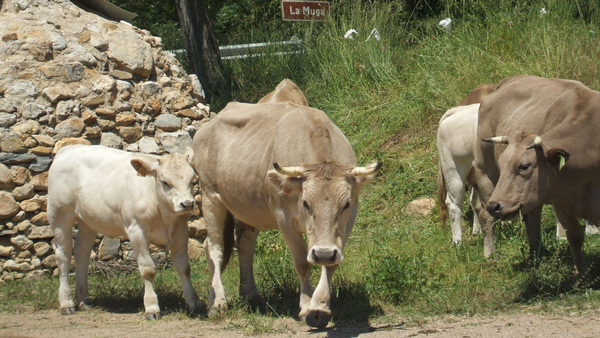 We have to pick up the cattle at la “Comella” house, where they stayed since the previous day. We will set off with a soft zigzag descent, following and crossing the river. We will ride past La Comella house which gives its name to the river we have been following. 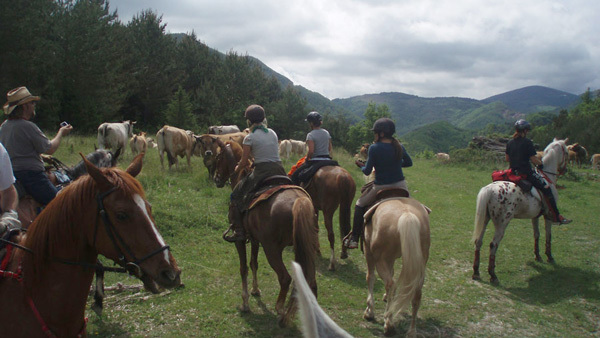 We will also ride past St. Julià de Ribelles, leaving the path to the Muga hostel to our right. 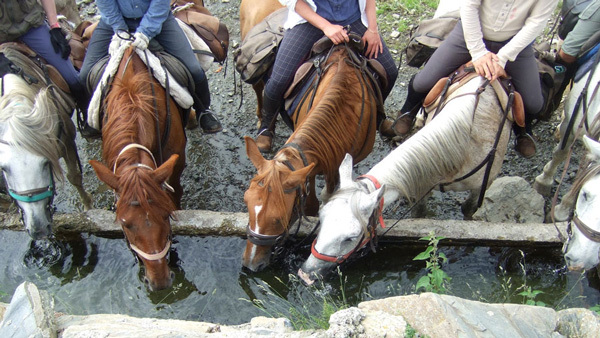 We will then follow the route towards the plains of Morató that get their water supply from the Muga River. We will leave the cattle here to spend the night and we will have our daily picnic. After having something to eat we will rest and, if the weather’s good (and you’re brave enough!) we will be able to have a swim in the clear waters of the river. After an authentic cowboy breakfast, we will tack our horses up. Once we have all helped to round up the cows, we will start by making our way along a very narrow path which is surrounded by dense woods. We will encounter an extremely thick forest, where we will have to protect ourselves from branches and, at the same time, making sure not to let any of the cows out of our sight. To our left we will see the Pic de les Bruixes, which literally means the “Witches’ Peak”. A precipice will force us to go towards the Coll de les Falgueres magically appearing as a clearing in the middle of this mysterious forest. By now we will have crossed the border into France where the paths will be wider and easier. From here on we will ride down to the river that crosses the village of La Manère and then up the other side towards the Coll del Malrem crossing the border once again, this time back into Spain. 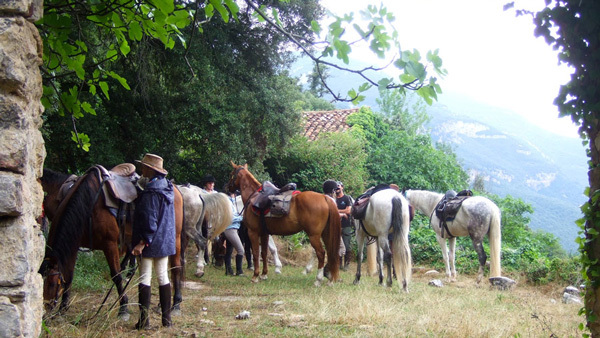 Wake up at 8 am and after having typical Catalan breakfast we will tack our horses up for the last time. 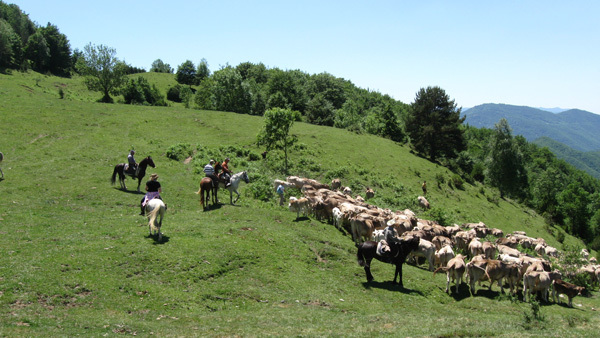 We will then fetch the cattle and lead the herd towards the Rocabruna road continuing from there to a village called Font-Rubí. 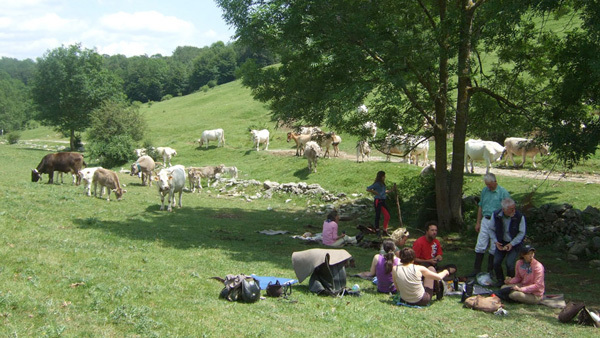 We will begin our last descent down through the Coll Pregon until we reach the village of Camprodon, which we will cross as the cattle path still passes directly through the middle of the village. Regional and tourist people are waiting for us... our arrival is spectacular!